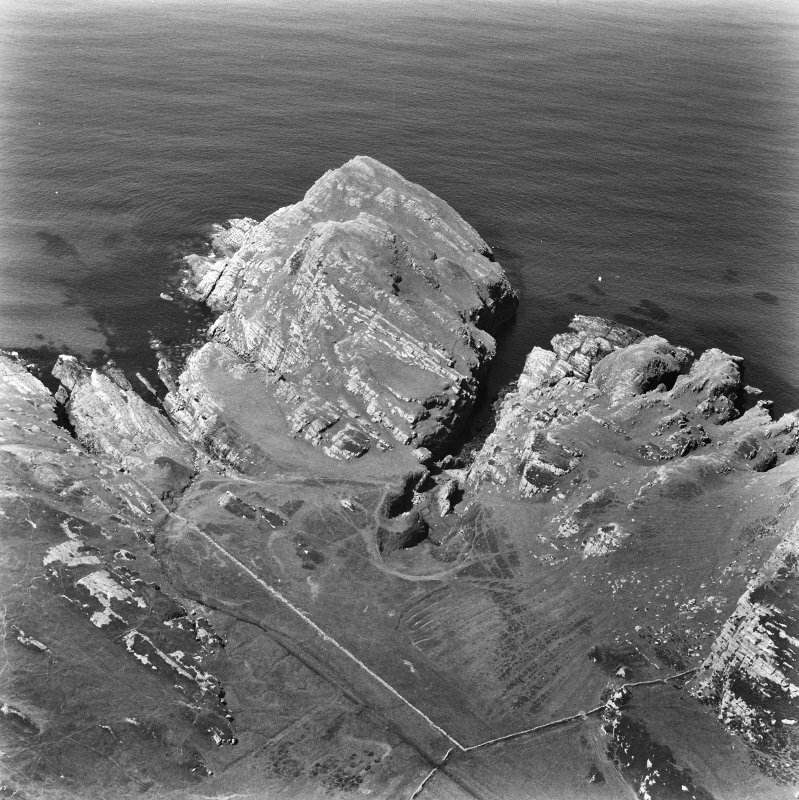 Dun Bheolain (name not verified) is a poorly preserved promontory fort (information from RCAHMS) defended naturally on three sides (NW, NE and SE) by high steep coastal cliffs. 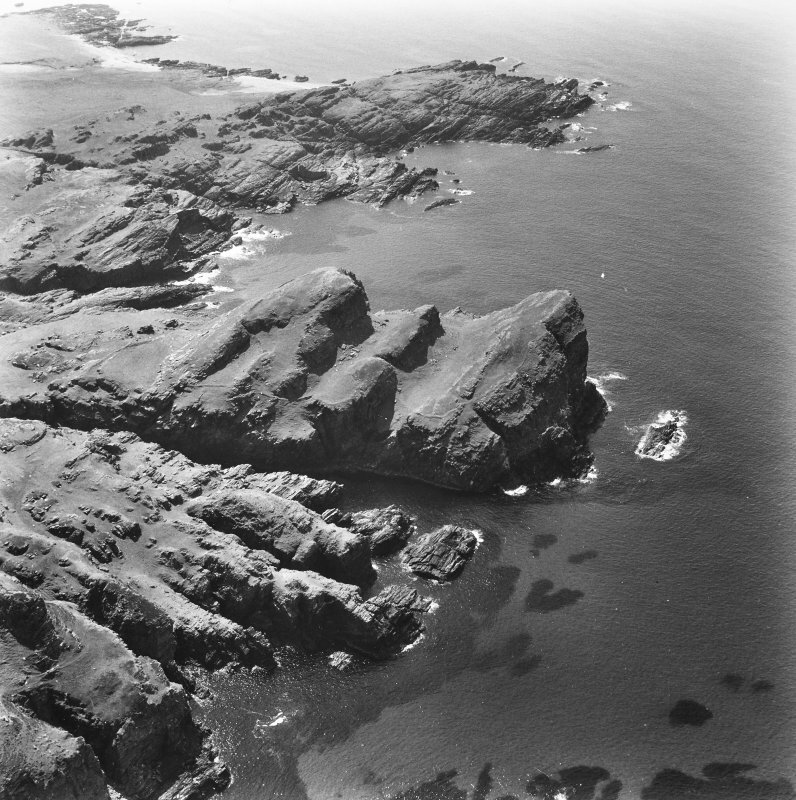 The promontory rises from the SE landward side in two distinct 'steps' formed by rock outcrops; these are further defended by the walls of the fort. The outer wall curving from the north around to the south west along the top of a rock outcrop survives as a 0.3m high turf covered rubble 'bank'. There are no facing stones visible and the 55.0m long 'bank' averages 3.0m in width. The grassy area between this 'wall' and the base of the next rock outcrop is sub-triangular measuring 55.0m NE-SW by 35.0m and slopes gently towards the north east. 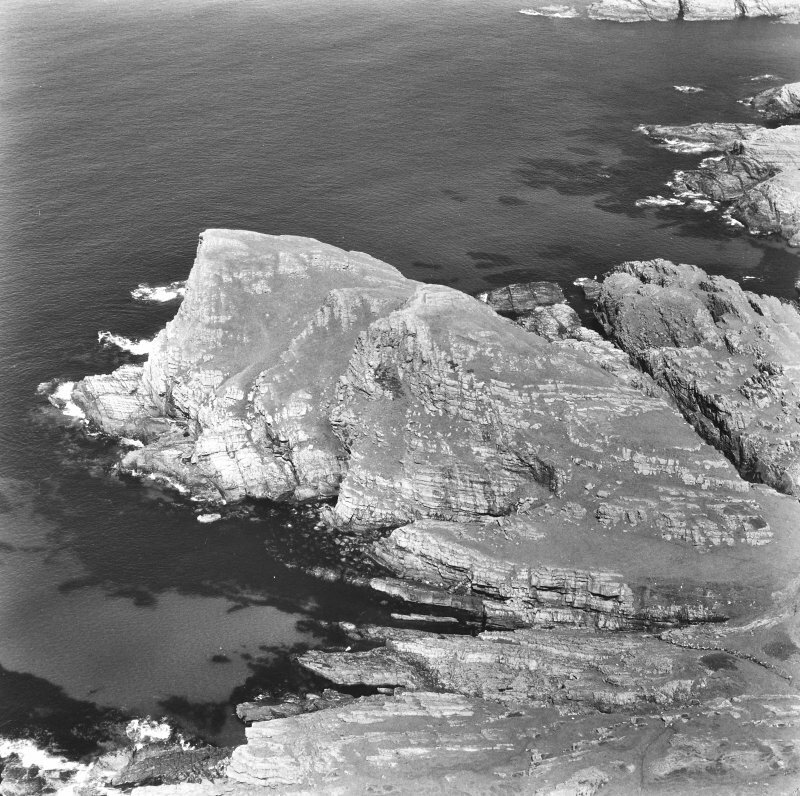 At the southwest end of this enclosed area is a 5.5m wide 'entrance' gap between the rock outcrops; there is no evidence of artificial consolidation. Curving along the steep slope to the south below the rock outcrop is a poorly preserved built up pathway. It is approximately 40.0m long, 3.0m wide, turf covered with no facing stones visible. At its west end near the above mentioned 'entrance' gap is a 9.0m by 7.0m sub-oval structure. Levelled into the slope the west side is defined by a 1.0m high scarp; the other sides by a 1.2m wide turf covered rickle of stones. The strategic position suggests some form of guard usage. Approximately 60.0m west of the first wall a second wall curves across the promontory above the top of the second rock 'step'. This 80.0m long walls survives as a turf covered 0.2m high stony scarp. The enclosed area formed by this wall and the cliff to the west is sub-rectangular measuring 75.0m NE-SW by 35.0m. There is no entrance evident and this grassy area slopes steeply towards the northeast. Near the higher south west end two sub-oval (7.0m by 5.0m) levelled platforms may mark the site of huts. New Statistical Account (NSA) 1845; F Celoria 1960; F Newall 1963. 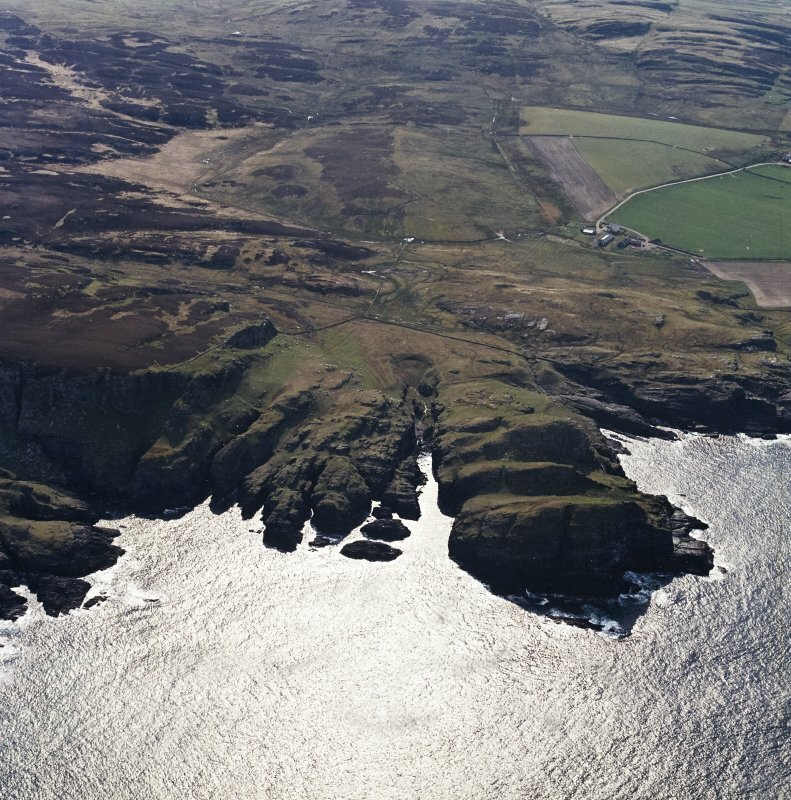 The largest promontory fort on Islay occupies a massive rocky headland 500m NW of Smaull. 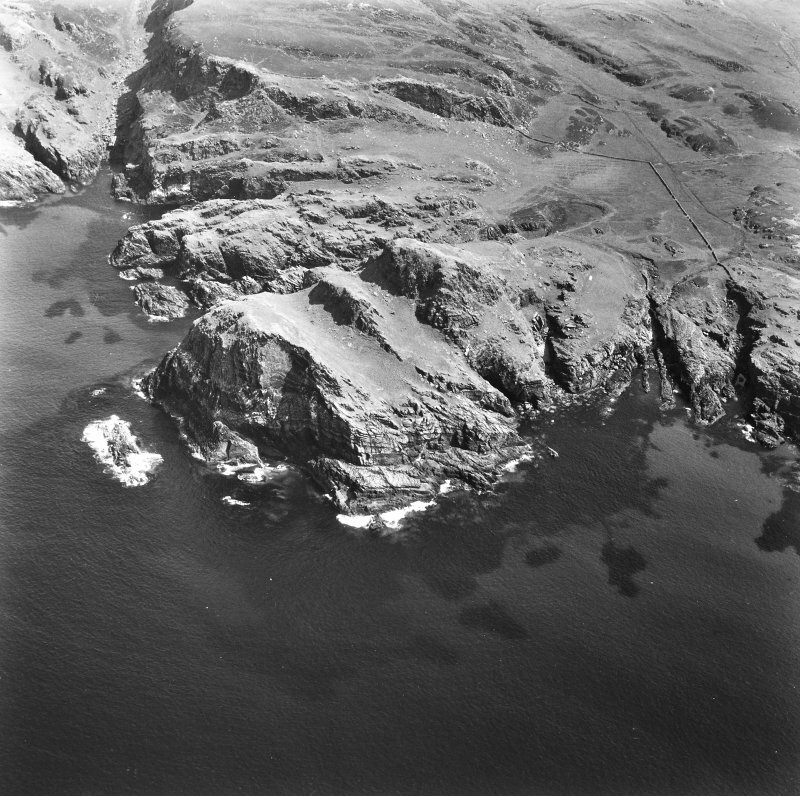 Jutting into the sea towards the NW, the headland is separated from the rugged coastline by deep narrow inlets on the NE and SW, their heads being only 40m apart; the approach from the SE is thus constricted, and from all other directions bare cliffs make access difficult, and in many places almost impossible. The headland is divided into three transverse rock masses, the highest (easternmost) standing to a height of 72m OD; while their landward sides rise in a series of sloping sheets of rock and inclined grassy shelves, their seaward side present, in each case, a sheer rock-face, the westernmost plunging some 63m to the sea. 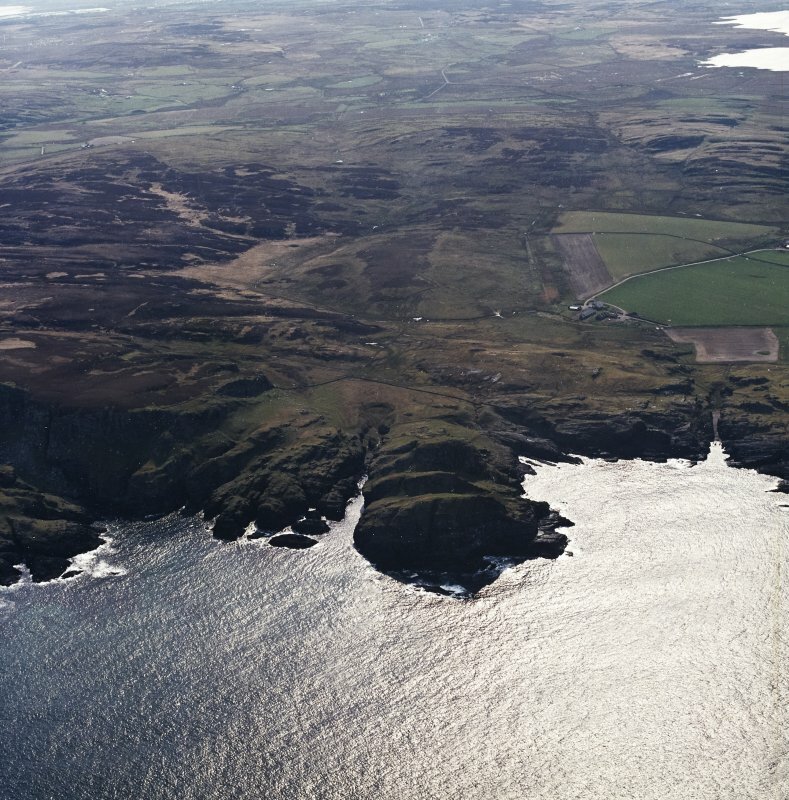 Viewed from the N or S the headland's stepped profile provides a prominent landmark on the W coast of Islay. The principal defence was formed by two stone walls drawn across the SE face of the headland between the edges of the cliffs on the NE and SW. The inner wall (A on RCAHMS plan) is in two sections, of which the upper springs from the cliff's of the summit (and about 12m below it) and follows the line of a slight break in the slope for a distance of about 60m, curving gently downwards to end on the edge of a sheer transverse rock-face just N of a narrow cleft in it (a on RCAHMS plan). From the foot of the cleft, the lower section of wall A continues northward for 19m before turning NE to run along the crest of a broad rock-spine which ends abruptly on the brink of the inlet flanking the NE side of the headland. Now severly robbed, wall A was, however, a substantial structure, a feature of it being the skill with which its builders incorporated rock-outcrops in its fabric; the spread of surviving core material suggests an original thickness of at least 3m, and a few short stretches of outer facing-stones remain in position, standing at best to a height of 0.5m in five thin courses. There is an entrance through both upper and lower sections, neither of them well preserved. Between 25m and 30m below the general level of the upper section of wall A, the profile of the landward face of the headland is broken by a broad grassy terrace measuring about 45m by 25m and falling some 6.5m towards the NE. This terrace shows evidence of former rig-and-furrow cultivation and still offers goood grazing, and its forward edge, which overlooks a broken rock-slope up to 11m high, provided a convenient seating for the major portion of the outer defnsive wall (B on RCAHMS plan). Only a few outer facing-stones remain; some of these, however, are massive, the largest measuring 2.0m in length and 0.3m in height, and itself the uppermost of three courses forming a section of outer face 0.6m high. More core material survives than in wall A and suggests that wall B was not less than 4m thick at the base. On the NE it turns through almost a right angle before ending on the edge of a rock-face falling to a ledge below. 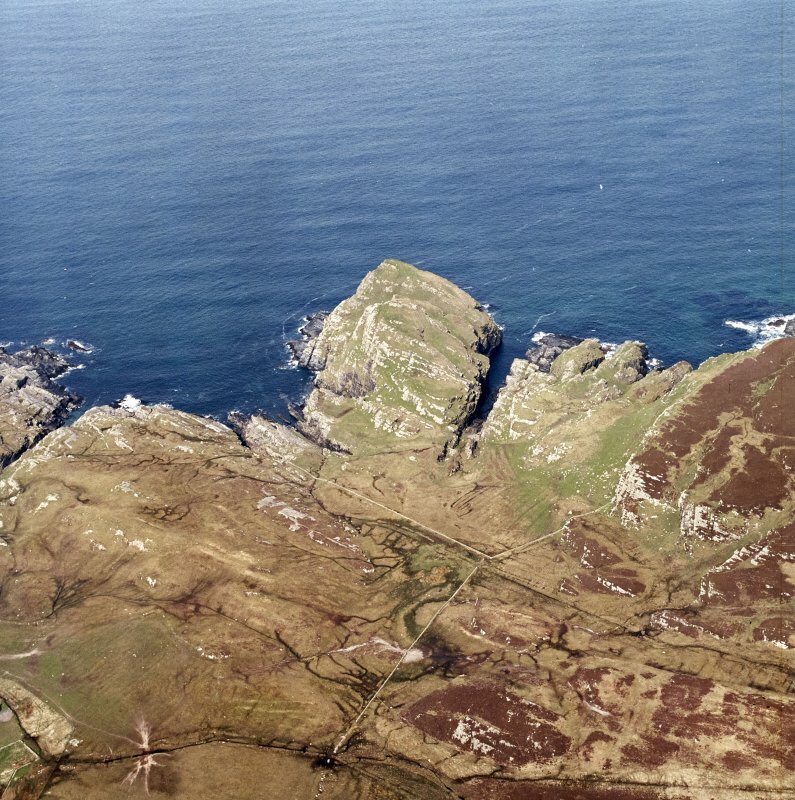 A spread of rubble (b on RCAHMS plan), which extends across the ledge to the brink of the cliff, represents the remains of a short wall designed to seal of this line of approach. The entrance through wall B lay nears its SW end, most probably at the top of a natural inclined grassy track which leads obliquely upwards across the rocky slope. Along the outer edge of the track are the remains of a substantial wall with a few outer facing-stones still in place, and there may have been some kind of outer gateway at the foot of the track. The principal entrance, however, has been destroyed by the construction of three subrectangular platforms of later date. 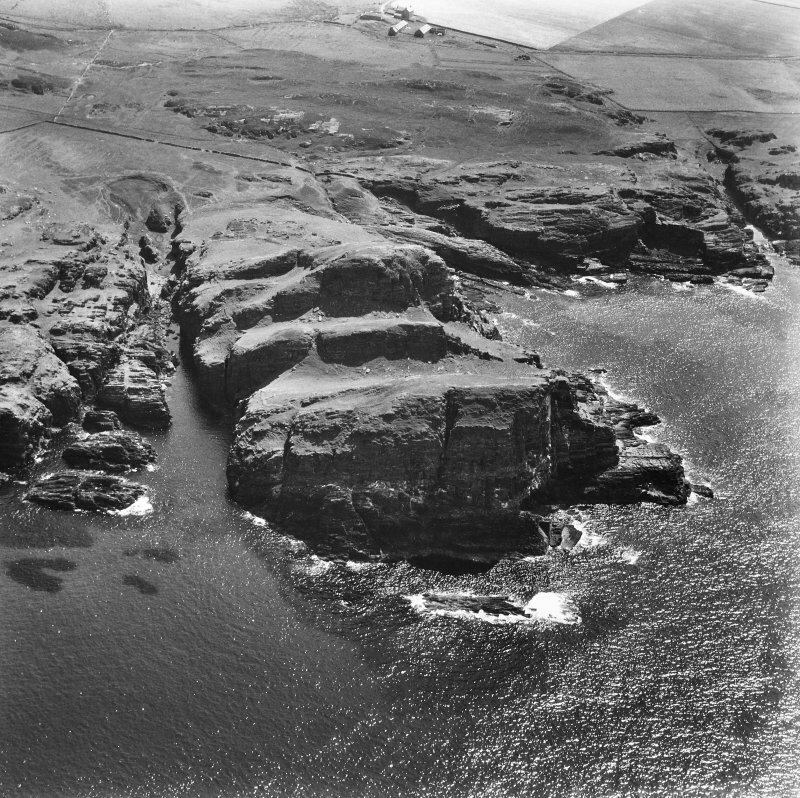 Wall B would have effectively blocked approach from the landward side; and at the only point, on the SW, where access would have been feasible from the sea, several massive blocks were brought together to form a crude but serviceable barrier (C on RCAHMS plan), measuring up to 1.3m in height in three very irregular courses and extending over a distance of 10m. Below the summit, and within the area isolated by wall A, seven small platforms are visible. Dug into the slope, they form a compact group, the lowest of them lying 9.5m, and the highest about 3m, below the level of the summit. They appear to be rectangular rather than circular, and their rearward scarps vary between 0.3m and 1m in height. Their function is unknown, but their exposed position makes it unlikely that they were stances for houses and it seems probable that they were associated with the three platforms already mentioned that occupy the position of the entrance through wall B. There is little doubt that these latter platforms were contemporary with the remains of the turf wall which overlies wall B both on the outer edge of the approach track and throughout its course along the forward edge of the terrace. The turf wall can be followed along the whole length of the NE side of the headland and round to its most westerly point. One further isolated stretch is visible at a low level on the SW at the foot of the S end of the summit. This turf wall, the platforms and the rig-and-furrow cultivation may all be associated. 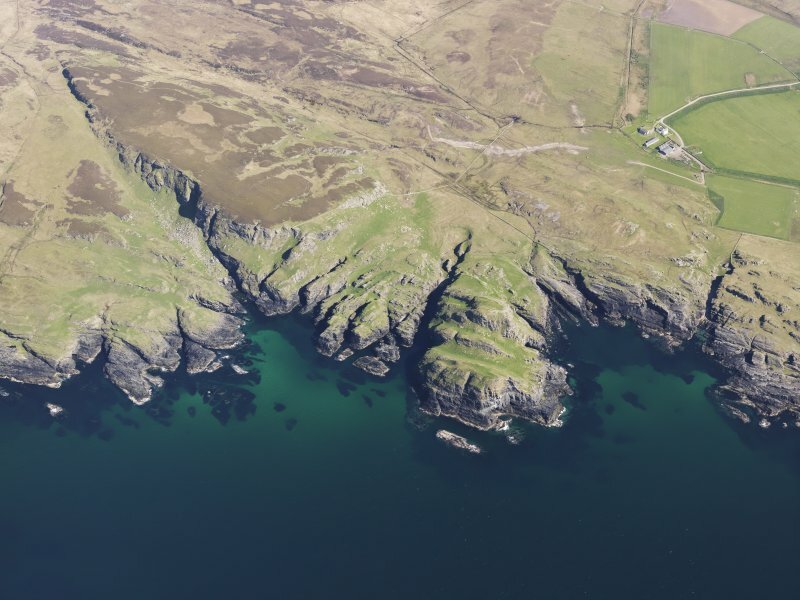 This large headland, girt by cliffs everywhere except the SE, is crossed transversely by a series of rocky ribs separated by grassy gullies, which combine to give a distinctive stepped profile from the S and forms a prominent landmark on Islay's W coast. Two walls cut across the neck of the promontory, the inner adopting the leading edge of the first of these ribs on the S before swinging round the top of a broad gully to descend the slope to the cliff-edge on the N, and the outer the edge of a terrace on the slope below it on the SE; at least two possible points of access are also blocked by short lengths of wall. To the NW the interior extends for a distance of some 165m (2.33ha) and includes two of the grassy gullies cutting transversely across its axis, though there is no trace of any occupation in either. On the upper slope of the rib behind the inner wall, however, there are at least seven small irregular platforms, which the RCAHMS investigators suggested were probably rectangular rather than circular, and were perhaps associated with another three that they believed overlay the entrance through the outer wall adjacent to the SW margin of the promontory. This takes in an additional 0.5ha, largely made up of the terrace below the inner wall, which has also been enclosed by a later field bank and cultivated in rigs. 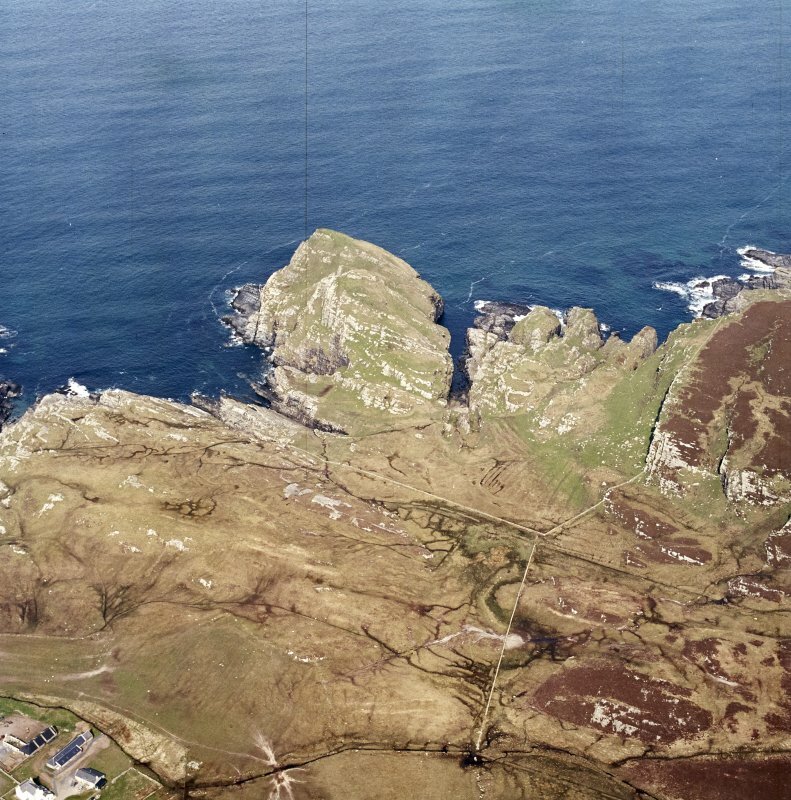 While the three platforms observed by RCAHMS are set across a natural ramp extending up the slope, the configuration of the defences at this point is unclear, partly on account of the heavy stone robbing, and the entrance may have been lower down the ramp, where a natural cleft in the outcrops provides a natural line of access through the wall and up onto the terrace. Despite the uncertainty about the precise course of the outer wall here, there is evidence of a wall following the outer margin of the ramp and the two lines may have overlapped to form a confined entrance passage. Two gaps have also been identified in the inner wall, controlling access to the seaward end of the promontory. The interior has evidently been enclosed and utilised in later periods, which, as RCAHMS suggest, may account for the construction of the small platforms.